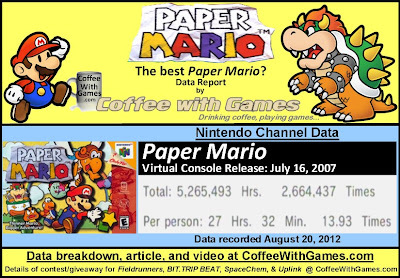 Paper Mario has approximately 191,273 U.S. Wii owners that have reported hours through the Nintendo Channel, with 1,862 days possibly reported since the game released. The has an average play-time per day/session of about 1 Hour 58 Minutes, and its overall average is 27 Hours 32 Minutes as the image shows. What about "professional" critic review scores for the game? The game has a "professional" critic review score average of 88.74%, based on 33 reviews on GameRankings.com. 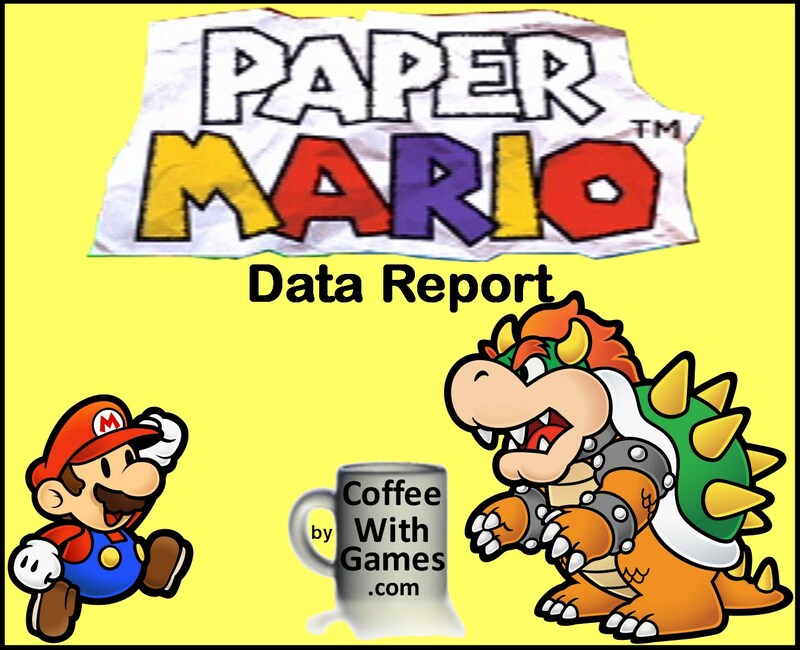 Paper Mario's Virtual Console release has made Nintendo about $1,912,730 just based on the number of U.S. Wii owners that have reported data and the $10 price point. I am interested in the Paper Mario games, because I think the concept behind them looks very original and interesting for Mario games. Seeing Paper Mario on the Virtual Console having "27 Hrs. 32 Min." reported as its average play-time "Per person", and knowing the game only costs $10 I think makes this game an incredible deal. What about being the best Paper Mario though? 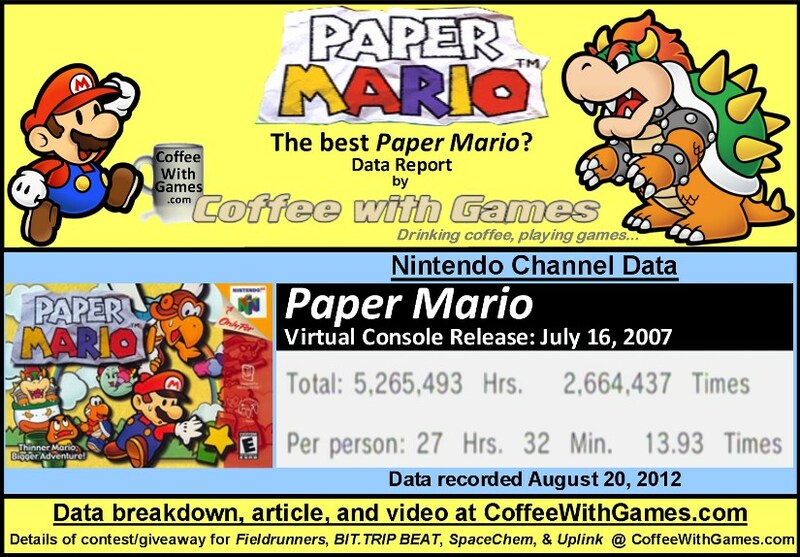 Well, according to the "professional" critic reviews available for all the Paper Mario games on GameRankings.com, this Paper Mario has the highest review score average of them all. If you are here for the contest/giveaway information, you can find information on it HERE. If you have already entered it and are looking for more entries, just tweet out this post using the "Tweet" button at the bottom of the post and add/include my Twitter tag, @CoffeeWithGames. You can also get an additional entry if you have "liked" the CoffeeWithGames Facebook page, HERE, and by liking this post on the page. Look for this section of buttons below to tweet it out. Have any of you played all of the Paper Mario games, and if so, which one do you think is the best of the series? If you have played perhaps just one of them, what did you think about it? I still think SMRPG on the SNES is way better. Just sayin. I have the data for that one as well I believe, is that the Legend of the Seven Stars one? HIGHLY recommend you pick this up, Coffee. It's a must-have! I've played all Paper Mario games and TTYD is the best one IMO, but that doesn't make the original any less desirable. I thought this was a pretty decent game, without living up to the hype that others give it. 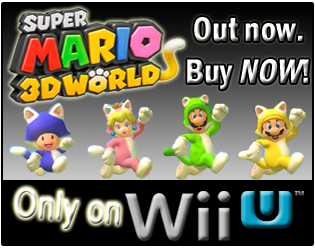 I mean, at its core it's a too-simple JRPG, with a healthy dose of the Mario charm. Now, the Mario charm does elevate the game well above other standard JRPGs, but an all-time great game? Not to me, no. Then again, for $10 you can't really go wrong. It'll last more than 10 hours, so that's good value. I haven't played any of these more than a few minutes myself, which is sort of sad since we have two or three different ones. My son really got into the Thousand Year Door one. My youngest really likes the Wii version. "HIGHLY recommend you pick this up, Coffee. It's a must-have!" Considering its price/hours, I think it shows it is a great bargain. Being that the Wii U is Wii games compatible, but not compatible with GameCube games, I wonder if Nintendo will make TTYD a Wii U eShop game? "I mean, at its core it's a too-simple JRPG, with a healthy dose of the Mario charm." I think this may be the reason to buy it. Bean 1 has a pretty good understanding of the Mario games now, 2D and 3D, and he is getting around levels pretty well...adding another Mario game to the mix that he can run around in, and perhaps pick up new game-play elements from might be cool, plus it would be a bonus for me since I could give the series a try. "Then again, for $10 you can't really go wrong. It'll last more than 10 hours, so that's good value." Well, according to the data it will last more than 20 hours, if I'm "average" with it. "I haven't played any of these more than a few minutes myself ...."
TTYD seems to be a favorite of people that have enjoyed the series in general, at least from comments I have been seeing around. 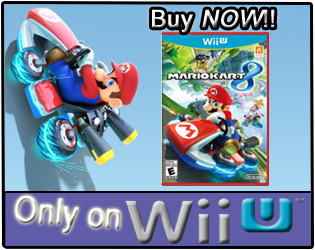 As I asked @twitter-129084253:disqus above, do you think Nintendo will make TTYD available on the Wii U's eShop? I'll be curious to see if Bean 1 sticks w/ LBP or not. My youngest 2 played the heck out of it, and my youngest in particular really got into the design aspect. That's the sort of thing I'd have eaten up as a kid myself, so it's interesting to see her drop hours into laying out levels and such.